Ooooooofffffff!!! OH MY GOD I don’t think I’ve ever cried so hard for a book before in my life (and this isn’t a “death” one, I promise). This is all about life, and living… or trying to. Anyone that enjoyed “After I Do” will get me, with this one. It has that feel, but I’m almost tempted to say, even more intense at times. Or maybe it was just me? This week? ‘Cause I could NOT stop crying. In fact, I think the last time it’s been this bad, was when I read The Host a few years ago… like many years and tears ago (and if you read that review, you’ll know how bad I was…). HOLY. MOLY. It took me FOREVER to read this… but not because I didn’t love it. But because I could barely read through the darn tears. I cried… and I cried. And I sobbed. And I sniffled… and pouted… and giggled, and “virtually snuggled her dog” and sobbed and laughed, and cried and cried and cried and cried. I. AM. EXHAUSTED. And I started crying practically from the start, and didn’t stop to about ohh… I dunno… 85… 90%? *snort* You guys. Don’t let that scare you. I cried, because I KNOW…. I KNOW EVERY SINGLE PERSON can relate to this book in some way or another. So BEAUTIFULLY written, so real, so infuriating, so frustrating, so powerful… so sad. So hopeless. SO hopeful. It encompasses EVERYTHING anyone that has been in a serious relationship has eventually gone through (married or not), but the fact that divorce factors into this one BIG time, anyone that has ever been, or contemplated being separated or divorced, this one is TO BE READ!!!!!!! We might be good people separately, but we were monsters together. I was doing the right thing. I wanted to be happy. I wanted to live a life without screaming and name calling. I wanted to breathe again. Not because it’s a cautionary tale for everyone in this situation (I truly believe every relationship and personality is different, every circumstance leading to a potential endings have their reasons, many valid and necessary), but, I dunno. I just feel like everyone in a relationship, would benefit from reading this one in some way. Even if it be to just… have a good, deep, soulful cry. I can’t imagine the author didn’t cry her eyes out, too, writing this. This one hurts! Maybe we were really better as friends. Maybe we had to get out of our marriage in order to appreciate the other person for who he or she was. GAH!!!! The internal dialogue, the grievances (whether valid or exaggerated) will have you RIGHT THERE with her. And you know what? Probably even RIGHT THERE with him, too!!! ‘Cause in this one? Neither one is the villain. Neither one is necessarily wrong, or the “bad guy”. Neither one has done anything outwardly… “wrong” to the other… you won’t even find yourself taking a side. Because BOTH have taken each other for granted, not supported each other in ways that the other needed, perhaps even allowed one to take on the brunt of the relationship. Most of the “effort”. To the point that both completely lost themselves, lost their “happy”, lost their love, and lost each other in the process. This is a case of circumstance and emphasis on all the wrong things in life. Too many years of too little effort. Or maybe too much effort, but just in all the wrong ways. No matter. Their need to be apart is inevitable. I had never known this kind of depression before. I could hardly tolerate my soon to be ex-husband and yet his absence left me unexpectedly battered. And it’s what they learned while they are apart that had me sobbing into my pillow. Recording my reactions would have been this… all the way through… with a ton of UGLY crying. Oh I have that picture, too. *yikes! * I tried to compose myself enough for a more normal looking one… like this. Ugly crying? Yeah… that’s real. I have proof. Maryse: I’m finishing a book that I’ve pretty much cried through, from start to “almost-finished”. It’s been an awesome read, but my heart aches. BADLY! I’ll be reviewing it tonight. I didn’t record myself, ’cause it would have just been a big red-nosed, puffy-faced, ugly cry fest and nobody wants to see that. LOL! bev: Yes, Maryse, that’s the one Amy wanted. Lol. 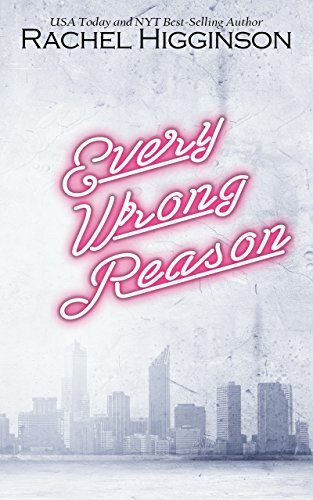 Theresa: Oh and I love Rachel Higginson…can’t wait to read the review for Every Wrong Reason…I have that on my list for purchase! Maryse: DAMN THIS BOOK that won’t let me stop crying… will it ever stop? I swear I’ve been reading it for days ’cause I can’t see through my tears…and crying makes me sleepy. Maryse: Ugh… 89%… I’m a mess. I took a picture. I may include it in the review but it’s not pretty…*snort* Eh… this story is not pretty either, so it’s fitting…. Cheryl: MARYSE- that makes my heart hurt just thinking about reading Every Wrong Reason. Brings back memories of reading After I Do. I better stock up on Kleenex before tuesday! bev: I wonder how the Damn book is treating Maryse? Amy: Yeah…she did “damn” that book, so you KNOW it’s going to be rough if it has her full-on swearing without symbols. *snort* OMG I TOTALLY CURSED!!! *gasp* IN PUBLIC!!!! See? SEEEEEEEE how this book affected me? I threw caution to the wind and cursed in writing!!!!! LOL!!!! AHhhhhhhhh you guys it was AH-MAZING!!! This is yet another new “favorite author” of mine. First “The Five Stages of Falling in Love” and then THIS one? HOLY MOLY amazing-author alert!!!!!!!!! But does it fix them? Living separately? Does it solve everything they were searching for? We might be different people now. But he still knew me better than anyone else. Why did it hurt so much? If this was what we both wanted, why did it feel like death instead of life? I had loved this man once. I had loved him more than anything else in life. And now we treated each other like enemies. So all that to say… this may devastate you… or this may elate you, and it did BOTH to me. Any book that is poignantly written as to make me feel EVERY SINGLE moment in her life (we’re always “her”, by the way), any book that feels like it was written by someone that has ABSOLUTELY BEEN THERE, any book that embeds itself into my heart this deeply and can both break, and make my week, is my favorite!! “Do you think I’m making a mistake?” I asked the mess. P.S. It took me about FOUR days to read this book…. and NOT because the book wasn’t good (OMG I LOVED THE ENTIRE BOOK!!! ), but because I cried too much. READ IT!!! I wholeheartedly put my whole heart behind this one, and I can assure you… the author did too. And yes… if you let yourself go…. give yourself to this one’s realism, you WILL FEEL IT like I did. But it is SO WORTH IT. I promise!!!! P.P.S. Thank you so much to the author for sending me a review copy!! You’re killing me. Seriously. Not a “death one”, rofl. Now Amy will be all, “Damn it”, girl likes her “death ones”. Great review. Glad that this is a good read for you, lol. Just no crying books for me, right now. Though not sure if would with this one. I usually don’t cry easily with books. Maybe, then. Although… holy moly it gave me that same effect. Yes. ALL OF THAT. YES. Wow. That’s extreme. And thanking the author with a frowny face? Yep, it much have hit you in the feels big time. *hugs* Ebul awesome book that probably put you in a fog! *kicks book* Part of me is now tempted to read it, but the other part is screaming at me to back away now. GASP!!! I LOVED that, bev!!!! Your review almost made me cry. I am a New Yorker. I curse like a dock worker. Damn? That doesn’t even count. LOL you’re adorable. Think my doc will give me a script for some emotional sedatives so that I can attempt this book? The book that got me the most was Falling Into You by Jasinda Wilder. I have read it about 5 times and every. single. time. I ugly cry. Never fails. Um…*snorty-sniffle* If the review wasn’t enough to make my eyes and nose water, then the pics definitely were. Those alone made me want to cry *with* you. And you know what I really love? That I don’t know going into it if they are going to work it out or not by the end. THAT is going to make this so much more poignant. I’ll be there with you Amy, (and everyone else that decides to read it) and I’ll hold your hands.. and you can all snuffle my sleeve. Amy!!! I thought the very same thing. Women that stick together… er… ummm..
And keep your sleeves to yourself. Have you ever been around a sniffing child only to look down and realize that’s exactly what they did to you? *giggle* Aw Bev, does someone need a snuggle? *raises hand* I still need a snuggle. I’m always ready to snuggle! I didn’t read the review yet, I want to go into this book totally blind, but all the “crying” and woooahs….my heart rate is up already in anticipation of the ANGST!! Oh Maryse….you looked soooooooo heartbroken in those pics. I am a crier by nature… I cry when I am happy, sad, stressed, frustrated, oh and when there used to be Hallmark commercials (they got me every time!)!!! I can not wait to read this book….we can all use a good cry and a snuggle! Cuddles! I did read the author’s “sneak peek” at the 1st chapter and I felt sad and teary-eyed- the mixed emotions she was feeling and his hurt/anger. UGH-this is going to be a tough one, but can’t wait to read it! How weird am I?!! I’m kinda scared to read it. I’ve been through a divorce & it completely shattered me. My ex-husband was my brother’s best friend & we didn’t handle our relationship the right way, sneaking around & lying to everyone. At the time it was fun & exciting but later I realized it was just sneaky & sleazy & in a way doomed our marriage before it even started. Divorce, no matter the reasons or who initiates it, is hard on BOTH parties. Me, I felt like a failure. Aside from raising my kids, my marriage was one of the most important things I would ever do in my life…and I failed at it. At least that’s how I felt at the time & for a long time after. That I had failed at one of the biggest things I would ever be a part of. I had trouble facing my friends & even my family. I’ve since remarried & have been married to him for 10yrs but I swear….I never, ever want to go through that kind of hell again. Ela you kill me!!!! LOL!!!! I love each and every one of you, I swear I DO!!!! You guys make my day, and I’m FINALLY done crying… and it feels so good! Ahhhhh but I would not ever take back that reading experience. It was incredible. Therapeutic. Fulfilling. Lauren…. what you just said is A TON of what this book is about. I get exactly what you are saying… this book really cuts to the core. It could almost be a “trigger” for some. After that review, this one is a no-brainer for me. Can’t wait for tomorrow! I loved After I Do and have had 5 Stages on my TBR forever! *big squeeeeeezy hug* I’m sorry about your grandma. Agreed, Cheryl… there is nothing out of the way, that goes on in this one, in regards to stuff like that… (you’ll love them both). Just real life, real couple issues and resentments and reactions and words and actions and… AH. I’ll start crying again. Tasha, is that the movie that was written by the two woman that star in it? I think I read something about that when it was in the theater. Got lots of great reviews. Lauren, I have absolutely no idea who it was written by, it popped up in my news feed on Facebook and I was curious so gave it a shot. If it was written by them though, how cool! They did a really good job, lol I was fully prepared with backups that sounded good if it sucked. Oooooo I’m all over this one! Sending a hug Maryse after seeing how much crying you were doing in the pics 🙁 My ugly cry face is too horrific to even take a pic of! Michelle, right? Like that’s her ugly cry face??? Lol. Oh Maryse you make me laugh so much….if you think THAT is ugly crying!!!!!! You still manage to look gorgeous…. even sans makeup and tear streaked. Bless. You guys… I didn’t post the ugly-cry ones. 🙂 They are horrendous! LOL!!!! But thank you for thinking THAT was my ugly cry. I wish. Tee hee!! !